Tranent Amateurs held on to lift the Miller Cup at Ainslie Park on Saturday after beating Carluke Hearts 2-1. Led by manager Brydon Fairgrieve, it is the first piece of silverware the club have won since being reformed in 2014, and came on the back of losing their previous two finals. Both teams took some time to settle with the occasion perhaps affecting players from either side. However, Tranent started to stamp their authority on the final, and after going close to opening the scoring several times, they took the lead in style through Cameron Reynolds’ free-kick which looped over the Carlukegoalkeeper and into the net. The opening goal came just at the right time for Tranent who continued to dominate with striker John Ferguson inches away from number two as he struck the bar. Opponents Carluke came back into the tie as it edged towards half-time, but Tranent held on to go into the break with their lead intact. Tranent would double their advantage after the break when Ferguson stopped to head in Reynolds’ cross. Carluke pulled one back five minutes later when their striker netted from what appeared to be an offside position, but Tranent saw the game out to land the trophy. Bank of Scotland Strollers produced a late double blow to go through to the final of the Victory Cup with a 2-0 win on home soil over Linlithgow Rose. Sean Samuels had the hosts’ best chance in a non eventful opening period, with the striker put through in behind Rose’s defence but he saw his effort saved. It wasn’t until the 85th minute that Strollers would net their first goal, with Paul Armstrong netting from a corner-kick. 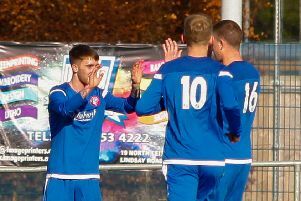 Linlithgow sent players forward in search of an equaliser to take the tie to penalties, and with just one defender staying back, Scott Ross and Anton Caballero combined to send Strollers through with the latter tapping in after his initial effort came back off the crossbar. Elsewhere, Danderhall Miners put six past Sandys in a surprise 6-1 rout in the quarter finals of the Premier Division Cup thanks to a double apiece from Darren Anderson and Graeme Cole, while Daniel Stewart and Kenny McMillan also got on the scoresheet.